The other day, I was thinking of the idea of the “transporter” from Star Trek. It occurred to me how drastically technology like that would change the world. At first, you just think of how cool it would be to “beam” yourself from Philly to Istanbul, or something. The technology of a transporter, however, would change everything. That change is a great example, too, of how what should be done (when possible) is held hostage by the fake world we have created out of politics, ecomomics and tradition. Cool. So, if we had these, we would eliminate the need for cars, trains and planes. There would be an instant and unbelievably dramatic decrease in pollution. Tangentially, this means the end of the shipping industry. The US Postal Service would no longer be needed. No more UPS or FedEx. Companies would “ship” products by “beaming” them to customers, the world over. Doctors would be able to work a shift in Sidney, even if they lived in San Francisco, and come home for dinner with their families -- or even for a lunch break; or even to leave work between visiting two patients in order to pick up a forgotten wristwatch. Families would never need to be apart. Kids could move to Alaska and still come to Sunday dinner at Mom and Dad’s in London. Distance would no longer be an issue. The atmosphere would become clean and clear. 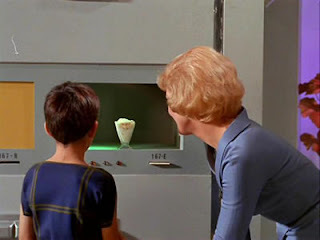 Following along the same lines, in terms of technology, the Star Trek universe also boasts a machine called the “replicator.” As long as this machine has the proper molecular codes in its memory banks, it can create any inanimate object. Nurse Chapel punches up a treat in the replicator. Now, you can go anywhere, instantly and have any object you need with you. What if we could do this within the next century? (Some physicists think that the transporter, at least, is within reach.) Would we do it? Sounds to me that we could pretty much create paradise on Earth. But would we? No. Why? We’re trapped by the machine we’ve made as a species. Too many cages have been built around the way we live. We’re not willing to be uncomfortable for any span of time. What would the truckers do for a living? The manufacturers? The travel industry? All of these phony human constructs are like invisible handcuffs on Liberty’s wrists. Anyway, we have a long way to go, I suppose. I'm really interested in hearing from all of you as to how the world would be affected by the technology of the transporter and of the replicator. Any ideas? I read this earlier today after a wonderful jaunt through sculptured gardens, and part of me wanted to respond immediately, "Yeah, that makes sense, the technology would be so useful and functional," and I still mostly think it could be. I agree with you that human societal constructs would likely hinder the proliferation, or even knowledge, of transporter technology, but I hesitate to suggest that these constructs would handcuff our species. There are numerous positives for a transporter that you list above, and I won't repeat them, and there are plenty of societal roadblocks (corporations, politics, money, etc. ), but there are fundamental human shackles holding back transporters. Humans aren't necessarily good, and the room for badness with the spread of transporter use is massive. Need to transport into a president's/dictator's/actor's/athlete's/revolutionary's bedroom to advance your cause (by killing), then you can. Need to spoil someone else's life by tweaking her transporter because you want a chance for an affair with her husband? Sure, twist a few molecules and her brain stops working or she's not even the same person. I think that transporters would have an undeniable utility for our species and even this entire planet; I do not think, however, that the technology would not cause suffering, would not be abused. Thanks, Matt. Any technology is potentially the root of good or evil, I suppose. I guess the reason why I don't believe in politics and in sociological engineering is that I feel it is worthless without a change in he human heart. Policy and technology will do nothing to bring about a Star Trekkian future. Poetry, music and literature just might get the job done, though. "We’re not willing to be uncomfortable for any span of time. What would the truckers do for a living? The manufacturers? The travel industry? All of these phony human constructs are like invisible handcuffs on Liberty’s wrists." I don't quite get it. 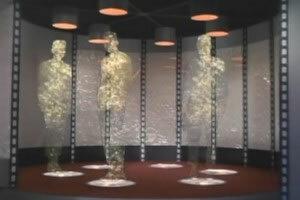 If the truckers go on strike as in the late 1970s, do we then suddenly get transporters? (We didn't then, and Star Trek was fresh in our minds.) If Carly Fiorina had run HP out of business, would the office copying machine be cranking out computers? Trucking is definitely a human construct, ergo artificial. But artificial is not necessarily phony. A great deal of artifice went into making your blog and our reading possible: high-speed internet connections; advanced computers; the power grid; generating plants; transportation for the generators' fuels; etc. etc. The transporter? Well, imagine Washington, DC, on the Fourth of July or Paris on Bastille Day. Now multiply the size of the crowds a few times, and you will see that the transporter works like every other transportation technology yet--the transition from high to low speed is a problem. Or imagine that we are too hip to fall for this, and disperse ourselves optimally. Then, I think, most of us just continue to whittle down our attention spans. In principle, the replicator has been realized over and over in history. Material goods have never been so cheap in comparison to wages, especially when you consider what they do. The cheapest car at the auto dealership is far better made and far safer that a car that only bankers could afford 40 years ago. An iPhone has computing power that the techies of 1960 would have marveled at. So I leave you to draw your own conclusions about the replicator. As always, a fascinating perspective, George. I suppose my "phony" comment is a little back-loaded and I am asking readers to understand a base philosophy of mine even though I haven't really articulated it here. Despite the practical ridiculousness of it,I have an aversion to the constraints of anything that is human-made, especially social and economic systems. Actually, especially economic systems. I really hate that we are enslaved by something as phony as money -- that our world is at the mercy of shiny metal that we have decided is worth something. The second-rate sci-fi visionary in me is looking for a Star Trekkian future but doesn't believe we can move away from our ancient ways. Thanks again for stopping by. Always good to hear from you. It would be nice to think that, once our skills are replaced with machines, we would, as humans, step in to higher-order roles, like further intellectual, emotional and artistic progress. This could happen, I suppose, but I also fear us becoming the Eloi. The 3D printer, well, that’s nearly here. I’ve seen architects use it for modeling, and here’s a more than two-year-old video showing Jay Leno (http://www.jaylenosgarage.com/extras/articles/jay-lenos-3d-printer-replaces-rusty-old-parts-1/) using it for prototyping old car parts. So, as Jeff writes (hi, Jeff! ), the replicator is not far terribly off. The transporter? That’s a different animal altogether. I’ve heard that remarkable invention is still a very long way off, as rearranging living molecules remains quite the feat. But I fear I tend to agree with Chris about technology and its tendency to outpace society and acceptable human behavior. Look at the poor bus monitor being terrorized by the kids in upstate New York. The world can be a most frightfully evil place, especially when folks gang up on the weak or even just someone they don’t like. Of course, the outpouring of support for her is heartening. We’d certainly like to replicate that aspect, wouldn’t we? I, for one, don’t wish to be an Eloi. But to be a Morlock seems no more desirable.